It's been two years since a bunch of us scraggy homegrown neo-anarchists took Zuccotti and sparked Occupy Wall Street. All across the world everyday people still remember those magical moments when #OWS held life in suspension and every dream seemed wildly within reach. 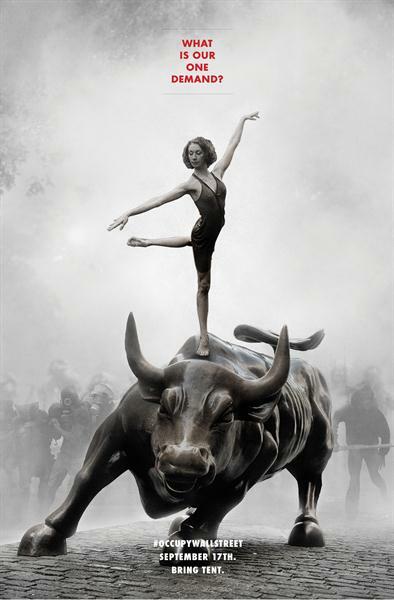 This year, we are commemorating the Occupy generation by offering, for a limited time only, posters and canvas prints of the iconic Occupy Wall Street poster. The proceeds of your donation will go towards an activist fund managed by Occupy Solidarity Network board members Priscilla Grim, Justine Tunney, and Micah White. Your money will go towards supporting movements for the common good. Give the gift of spiritual insurrection, posters and canvases now available, click here to purchase. The Occupy Solidarity Network is a 501(c)4 based in New York. Solidarity to those working in restaurants, Amazon-fulfilment centers, retail departments and Black Friday binge fests. May those at the top profit no longer. May we learn once again to be human together. May a new Jubilee come, from the people. We are thankful for you. Happy Thanksgiving. Without capitalism, there could be no undue influence of money in politics. Without capitalism, trade would be truly free. Without capitalism, the financial sector would be an embarrassing relic of the past, a warning to future generations. Without capitalism, there can be no neoliberalism. Anticapitalism is the true big tent. Whether or not you think the reforms proposed and enacted by various Occupy-related groups (like StrikeDebt, Occupy Sandy and the Occupy Card) will fix the systemic problems of capitalism, they are campaigns worth supporting. They provide temporary relief to people who need the most and allow us to experiment with alternatives. This is a good thing. But we can't let a good treatment distract us from a cure. Without addressing the underlying cause of capitalism, these problems will only get worse. Globalization will continue to send jobs overseas. Technology will continue to automate human labor and obsolete the professions of millions of workers who will have no choice but to adapt. But for those who can't adapt to the new economy, the sentence under capitalism is death. This is because capitalism denies the necessities for human survival (like food, housing, and health care) to those unable to sell themselves to corporations. Even in times of plenty when you'd think we'd have to work less and less. The end of capitalism means the beginning of your new life - a life where your home cannot be taken from you by force to maintain the bottom-line of a multi-billion dollar company that pays less in taxes than you; a life where you own your future; a life where politics represents you. The end of capitalism means the life you’ve always wanted but never thought you could have. The end of capitalism means freedom. The 1% owned the mainstream American political system long before the Supreme Court upheld Citizens United. The 1% oppressed the global 99% long before “free trade” agreements became the norm. The 1% used the financial sector to swindle the people long before Dodd-Frank was repealed, long before the Federal Reserve. It is important that as we oppose the institutions that capitalism has created to oppress us, that we oppose capitalism as well. If we allow ourselves to be held hostage by the symptoms of our disease we will never find our way to the cure. The cure, as we knew and demonstrated two years ago, is revolution. Two years after Occupy Wall Street was founded we are still here, and so are our problems. Take the street, take your jobs, take back your money, take back your power. Organize. 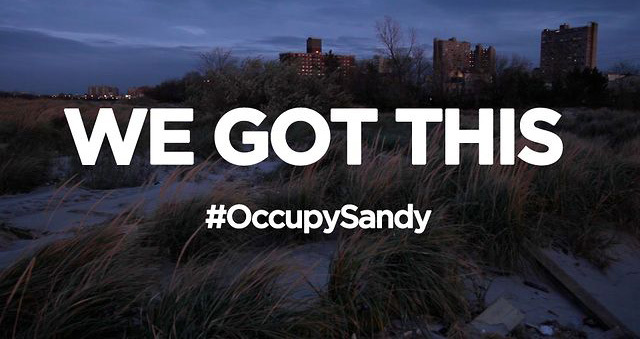 A full year after Hurricane Sandy battered the eastern seaboard, we can begin to glean valuable insight into the community-led relief network that sprung up in response, also known as the Occupy Sandy network. In late October 2012, as the “Superstorm” was approaching, Occupy Wall Street participants focused social media and interpersonal networks in preparation. By the following morning, the group had already begun to use social media and network-based communications to amplify the relief efforts in some of the the hardest-hit communities across New York City and New Jersey. In the days and weeks that followed, Occupy Sandy helped create and connect a complex, nimble, and oftentimes haphazard relief network. Donation centers, mutual aid hubs, open-source needs assessments, and volunteer assignment systems sprung to life, seemingly overnight. Drawing on the strengths of network-based organizing, these efforts were often more effective than the work of traditional, top-down aid organizations like the Red Cross. One of the tens of thousands of people who came together to make this network thrive was Sofía Gallisá Muriente, who spent the last year organizing in Rockaway Beach. Listen to her share her experiences from the effort and her thoughts about the future promise and latent perils that the Occupy Sandy network now faces. Organizing during disasters is becoming an increasingly important role of the social justice movement, particularly as climate change threatens to wreck havoc upon nations and people who are the least responsible for the pollution and exploitation of the earth. Today, tens of thousands of residents of the Philippines are organizing to survive amidst the devastation wrought by the most recent typhoon. So-called elected leaders refuse to address this crisis, evidenced by the utter failure of last week’s climate summit in Warsaw. Since politicians and the powerful continue to work for the fossil fuel industry, we must work for the people -- both to slow climate change by forcing an end to consumption and fossil fuel burning, and to organize survival networks that protect ourselves and our fellow humans against the climate genocide. As this talk demonstrates, this work has already started. Now, we must amplify it. 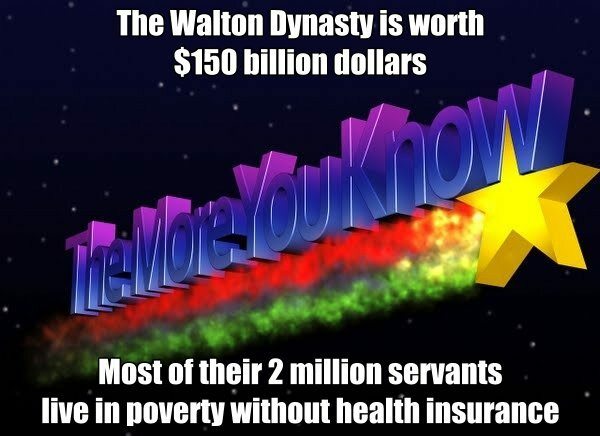 The Walton Family is collectively worth over $150 billion USD. Most of us struggle just to keep $150 dollars in our bank account, so it's hard to comprehend how much money that really is! Yet all of that $150 billion is divided amongst just 16 people. What if we distributed that money to the 2,000,000 global employees of Walmart? Is that too radical? If you don't think those people have earned the money, we could nationalize it instead. The Walmart fortune could be divided amongst the twenty seven countries in which they do business, granting each a settlement of $5.5 billion. We are talking about redistributing $150 billion from 16 people to a pool of 2.3 billion people. We're serious. The democratic systems we put in place to protect us from people like the Walton Family have failed. It's time to try radical alternatives. We literally believe that the time has come to take from the rich and give to the poor. With over 70% of the workforce on food stamps, this would immediately put food in the mouths of women and children who are always the hardest hit. One of the biggest problems in the United States is the support needed for people to start new businesses. Instead of loans, why don’t we just give people money to establish new businesses? The secret to building our communities is not sending in a company from outside, but to invest in the people living there, their skills, their talents. And an added bonus? Generational family groups can stay together and give each other the support that is needed, instead of being separated by economics. We would finally have the resources to properly take care of our grandparents and treasured elders. We would finally have the resources to support the Americorps volunteer program, and thus, our communities. What if we just nationalized (in each country that they work) Walmart? Then the only question would be, what would the United States do every year with its share of the $15 Billion in annual profit? This #BlackFriday Join the #WalmartStrikers on the Front Lines!